Home › Uncategorized › Phil Johnson rebukes Dr Michael Brown. We want to provide readers with Brown’s quote that kick-started the controversy and what Gracelife’s Pastor Phil Johnson recently had to say about Dr Michael Brown’s behaviour. However the highlighted opening sentence needs to be addressed. From our experience at CWC in working with online ‘discernment buffs’, many of them (no matter what their doctrinal beliefs), are genuinely motivated out of love to DEFEND Christ’s sheep from being manipulated or fleeced by false prophets and teachers. Many have gone through terrible experiences with false teachers and sacrificed a lot to take a stand on the scriptures that saved or led them out of an abusive cult or church. Likewise, they don’t want others to be hurt and provide websites or blogs to warn people to avoid dangerous men. So we should commend these people for being motivated by love to help defend, warn and protect people from wolves in sheep’s clothing. However, many are not privileged to be raised up with solid biblical churches or ministries and struggle to be a voice of reason. Furthermore, many do not expect to experience attacks from other Christians when they do start speaking out. Being on the receiving end of this type of attack by fellow believers, it is easy for them to be hardened in their hearts. This may motivate them to become more extreme in their analysis of church movements. And because they are more wounded and feeling more isolated with “insider knowledge” of these movements, it becomes very easy for them to not represent the facts fairly and with wisdom. Nevertheless, the reason WHY Christians are doing this is because these men (like Michael Brown) refuse to accept responsibility in their spiritual offices of Pastors/Teacher. 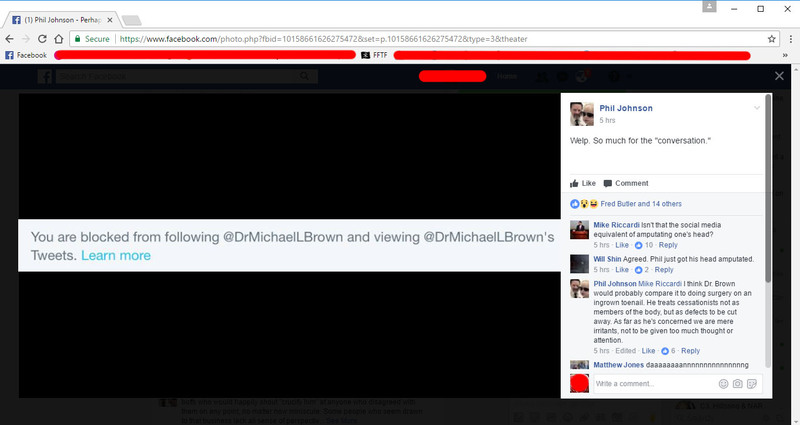 And because Dr Brown puts the onus on the sheep to PROVE that his friends or guests on his program are wolves, he is literally telling them to become the very people he shows vitriol towards. So these sheep are told that they are worthless to the church, even though they are trying to prove (whether anonymously or not), that what they say is true. It is time for pastors to stop beating the sheep and start reaching out to these individuals who have been damaged by hirelings and wolves. Their souls are too precious. So we ask godly pastors – consider reaching out to these lone sheep trying to act as shepherds to protect the flock from wolves. Phil Johnson: “Let’s face it: there ARE overzealous self-styled “discernment” buffs who would happily shout “crucify him” at anyone who disagreed with them on any point, no matter how miniscule. Some people who seem drawn to that business lack all sense of perspective. The term “heresy hunter” wouldn’t be my choice, but it is true that there are some really bad “discernment” bloggers and Twitterers out there. Jamie Robertson: “While this is a major blindspot for Dr Brown, I’m certainly thankful that it seems the Holy Spirit has kept him in spite of that failing. Seeing his Christian testimony of Christ in his interactions (either as debate opponent or co-participant) with Dr White has been greatly encouraging. Just goes to show what RC Sproul has in the past called a “happy inconsistency”. “It matters not if he’s done good work on homosexuality. As Phil pointed out, he constantly, dogmatically promotes heretics and false prophets…and trashes those of us in discernment who bring the truth to light.” Marsha West. Email all comments and questions to c3churchwatch2hotmail.com.